FREE Burj Khalifa for all flights departing until 31st August! 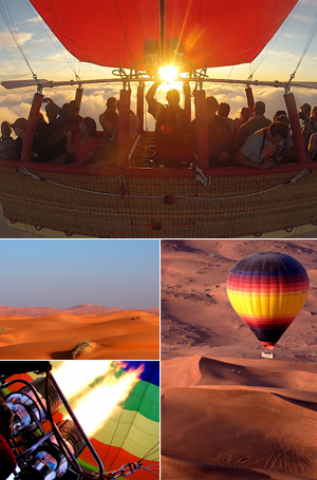 The perfect way to see the Dubai desert from above and below! 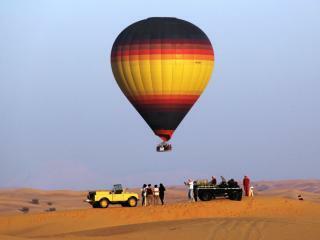 The Dubai balloon adventure starts with a pre-dawn drive to the launch site in the heart of the desert. 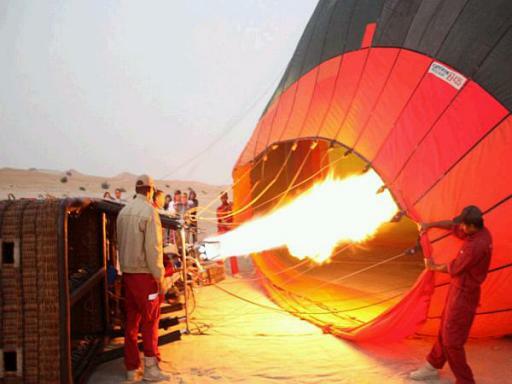 With the sun slowly rising on the horizon, the gas burners are ignited and the balloon slowly comes to life. Soon you are rising into the immense blue of the desert sky affording spectacular views of giant red sand dunes, emerald green oases, gazelles and wandering camels. If you are lucky you may even spot the mighty Arabian Oryx in their natural habitat. 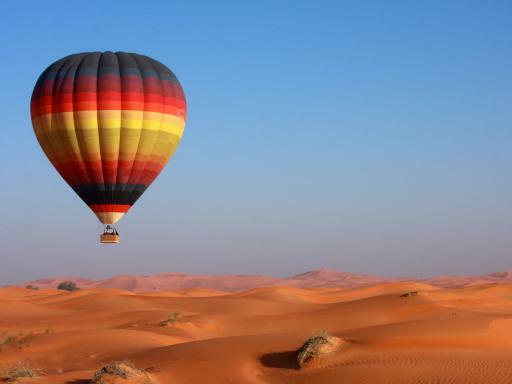 The Dubai balloon flight lasts for around an hour and each experience is totally unique with the flight route and landing location totally dependent on the wind strength and direction. 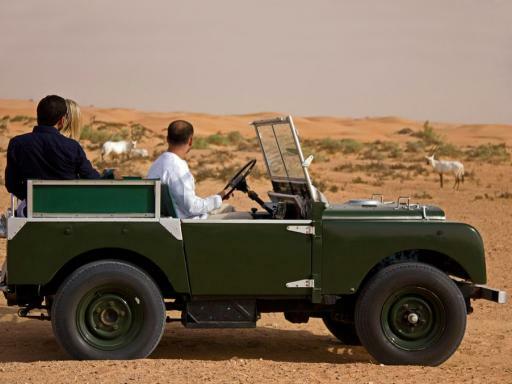 Once you land, you will be driven to a private desert conservation reserve in a museum quality, open top 1950’s Land Rovers. These iconic vehicles were the first vehicles ever to traverse the desert 6 decades ago. 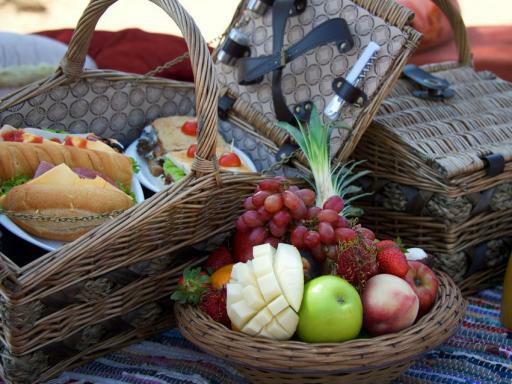 On arrival you have the chance to freshen up at clean, private bathrooms and will then be served a scrumptious breakfast including a selection of delicacies such as hand-cut smoked salmon and caviar, fruit platter and more. Afterwards, marvel at the speed and accuracy of the falcon as expert falconers put on an amazing spectacle of a show with these amazing creatures. 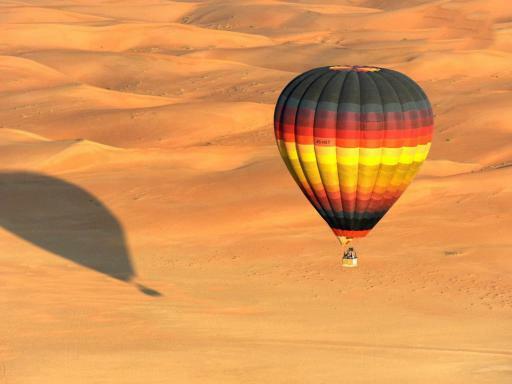 The Dubai Hot Air Balloon Flight with Breakfast Safari is a great way to experience the stunning Arabian desert from above and below. Departs: Daily, October to May only. The flight does not operate in the summer months due to the heat. Duration: Around 6 hours in total. 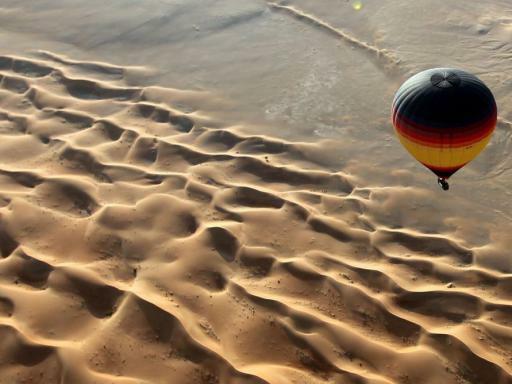 The balloon flight is normally around one hour. Start Times: Around one hour before sunrise (4.00am-5.00am). Your exact departure time will be re-confirmed locally. 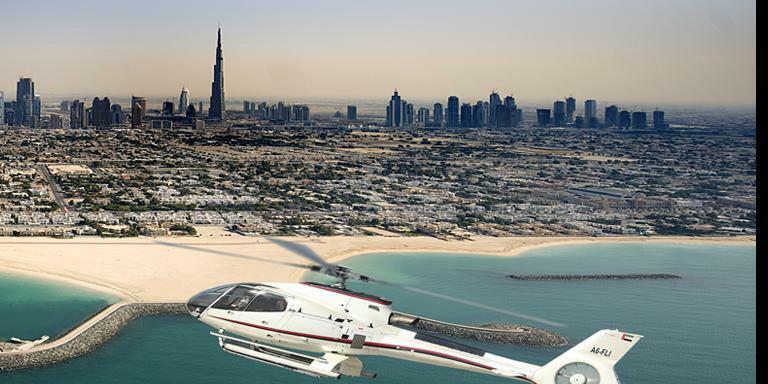 If you are in Dubai on a Friday, don't miss an extravagent brunch served in many hotels. 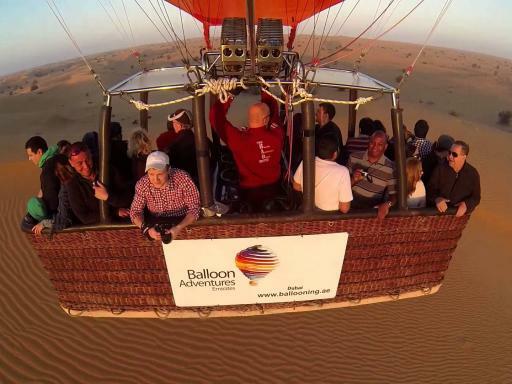 This is the latest Dubai craze. An amazing, out of this world experience!!! The staff were brilliant throughout - very friendly as well as professional. A glitch somewhere along the lines meant that they had only two people registered instead of four; we had also booked our two children. This was obviously worrying as it was only picked up on the day and panic set in but only on our part as the driver was very reassuring insisting that we relax and let him deal with it and that all would be well....and it was. A quick shuffle of passengers and we were well on our way. Brilliant staff and well organised; arrived for pick up on time and always looked out for the safety of all passengers. A wonderful experience!! The flight was amazing. The minibus driver seemed as if he was in a hurry. Hotel pick-ups are available from Dubai only. Passengers must be at least 5 years old. 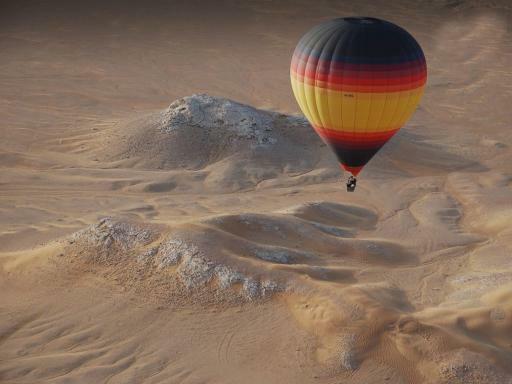 There is no upper age limit for the balloon flight. This tour only operates Mid September to May as it is too hot in the summer months. Exact flight time and route cannot be guaranteed as it is 100% dependant on the wind. Women more than 3 months pregnant and anyone with injuries or recent surgeries in their limbs or back are not permitted to fly. Discover the sights, smells and sounds of a Dubai Souk in our latest article and uncover the meaning of the ‘real Dubai’.